Global Food & Beverage Sterilizing Agent Market size was estimated over USD 360 million in 2018 and will exhibit growth of over 5.2% up to 2025. Flourishing food & beverage industry all over the globe is the major factor stimulating food & beverage sterilizing agent market. Changing consumer lifestyle and buying behavior coupled with growth of experience retailing and growing consumer’s desire to improve their standard of living with a leisure experience is driving the global food market. The trend has been experienced in developed markets like U.S. as well as in developing regions including Asia Pacific and Middle East & Africa. Sterilization is a technique adopted to eliminate or kill any form of life or biological agents like bacteria, virus, fungi etc. in milk and in any food and dairy products. The process is generally executed by filtration, moist heat, irradiation and through other chemical methods by using agents like hydrogen peroxide and peracetic acid in most of the food processing techniques. Increasing health concerns among consumer and awareness towards using ready to eat meals is the key reason propelling food & beverage sterilizing agent market. Manufacturing companies such as Solvay, Steris, Balchem and many others are adopting sterilizing techniques to increase the life of packed food products which in turn is making the consumers more attracted towards the product. Despite of being used in ample number of food processing applications, food & beverage sterilizing agent market can experience a setback in future due to strict government regulations in food industry along with negative health impacts of consuming hydrogen peroxide might lead to vomiting, pain, irritation in skin, gastric distension etc. Based on product type, global food & beverage sterilizing agent market has been segmented into hydrogen peroxide, peracetic acid and others. The other segment includes glutaraldehyde, moist heat etc. Hydrogen peroxide grabs a major market share and generated revenue over USD 185 million in 2018. The product acts as an antimicrobial agent in several food products including almost all dairy products as well as a food & beverage sterilizing agent in food processing & aseptic food packaging applications. Although the use is restricted to some percentage ranging from 35% - 50% in food processing techniques. 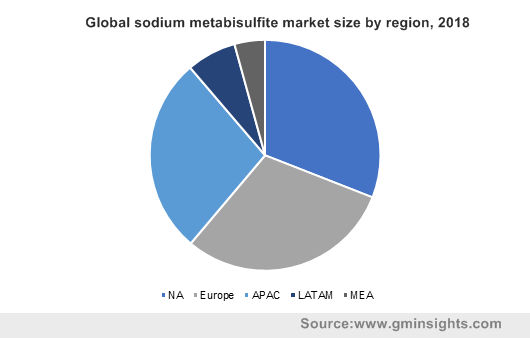 Peracetic acid segment held a decent market share and is likely to exhibit average industry gains close to 5% CAGR by 2025. 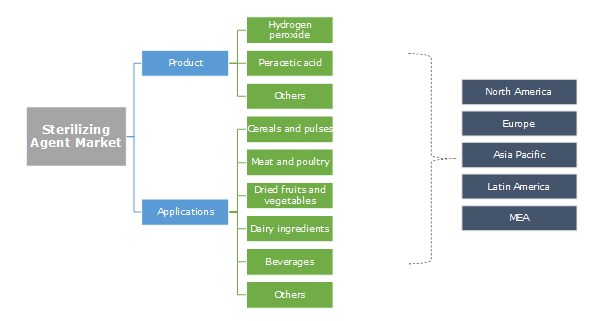 Peracetic acid provides many benefits in food processing techniques ranging from meat & poultry to cereals & pulses. The chemical compound is used to avoid food contamination by making the containers sterilized thereby, improving the shelf life of food reduce wastage. It also extended application in other food segments like beverages and spices & herbs etc. 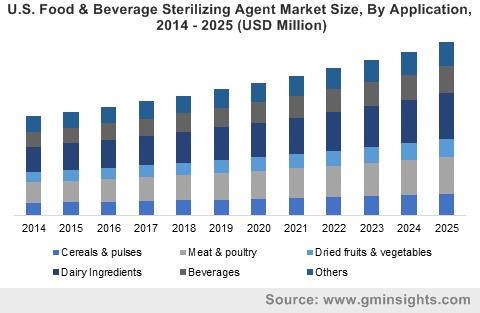 The global food & beverage sterilizing agent market has been segmented based on application into cereals & pulses, meat & poultry, beverages, dried fruits & vegetables, dairy ingredients and others. The others segment includes spices and herbs, tea blends and seafoods segment. The maximum share in this segment is attributed to dairy ingredients which accounted for over 25% in 2018. Sterilization of dairy products especially milk is aimed to kill all the bacteria and other microorganisms present to extend the life of packaged product and to enhance its usability for a longer time at ambient atmospheric conditions. The market for dairy products is expected to rise due to rising consumer awareness towards nutritional value of dairy products supported by adoption of a healthy lifestyle. Meat & poultry segment is the second largest accounting for over 20% of the overall market in 2018 as meat products possess a very high probability to inhibit harmful bacteria in several types of raw meat like salmonella, Escherichia coli and others. Sterilization technique can easily eliminate harmful microbial organisms in slaughterhouses that supply beef, pork, chicken and other meats. North America is leading the global sterilizing market solely lead by its well-established food industry. Rising consumption of ready to eat food as a result of busy lifestyles is the major reason propelling food & beverage sterilizing agent market in the region. Also, increasing purchasing power of consumers together with health and hygiene concerns is triggering the market growth. In addition, surge in tourism & catering industry in U.S. will offer a promising regional growth in coming years. Europe is the second largest market for food & beverage sterilizing agent followed by Asia Pacific. Europe also have presence of all formats of food retail outlets ranging from convenience Stores, hypermarkets & supermarkets, hotels, restaurants etc. Europe being a developed nation comprises of consumers demanding premium packaged food items which is augmenting the demand for sterilization in packing of food items. Food & beverage sterilizing agent market is fragmented as major sterilant in food industry are hydrogen peroxide and peracetic acid based which are manufactured by ample number of companies. Some of the major market players in this industry are Solvay, Steris, Peroxy Chem, Evonik Industries, Mitsubishi gas etc. Arkema, OCI Company Ltd., Hansol Chemical, Taekwang Industry Co, Ltd.etc. Companies are adopting various strategies to increase their revenue and to capture a greater market segment. for instance, Evonik introduces a new disinfectant active Hyprox AS which is containing hydrogen peroxide to be used in many applications including sterilization and in water treatment applications. Food & beverage sterilizing agents are chemical compounds that are used to preserve food products from contamination by microorganisms. Hydrogen peroxide is the most preferred sterilant in food processing owing to its ability to act as an oxidizing and food & beverage sterilizing agent. The overall market is uplifted by growing food & beverage industry throughout the world especially in developed regions like North America and Europe. Sterilant have their applications in a number of areas but they are majorly used in dairy ingredients especially in milk products followed by meat and poultry products.